I often find new artists to follow through tv commercials or movie soundtracks. One of my favorite playlists is from the movie, “Garden State”. I’m sure that the film’s impact and flow were significantly based on the music selection. Sometimes when I’m painting, I like to have the tv on for background noise. I don’t usually catch full commercials or shows, but I do catch the audio behind them. A lot of the Mac, Old Navy, and different cell phone commercials have some decent music attached to their campaigns. I can’t even tell you which company or phone Eric Clapton is advertising in his latest commercial, but I can tell you, I love the song they chose – “I’ve Got A Rock ‘N’ Roll Heart”. I looked up the lyrics and they aren’t that relevant, but the instrumentals are awesome. 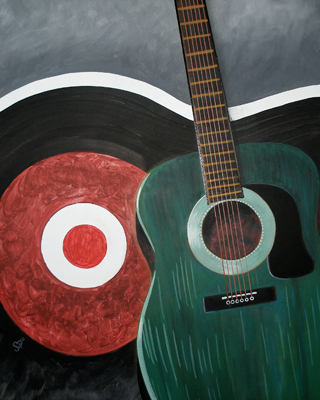 Oh yeah, the guitar in this painting is my trusty, (really) dusty acoustic that I was given by my parents back in college. I remember finally getting to pass down the fat neck student guitar I had used for so long; that was a good day! Now, I just need to learn how to tune it for the 89th time and play something!